Over roughly the past century there have been numerous accounts given from people near the verge of death describing extreme and often amazing experiences. They often described images and scenes that express certain consistencies. Amongst such consistencies are included contact by entities, the sense of travelling to some alternate place, and a feeling of euphoria and wellbeing. Although instances exist of experiences around the period of death from different time periods, only within the past century have such phenomena begun to become commonly known; accounts of such experiences occurring in books, films, and even day-time television talk shows. Given such an extensive presence in mainstream culture, there have been numerous inquiries into these experiences. The earliest investigations of these phenomena were done from a perspective usually aligned with that of the parapsychologist, and as such investigated the experiences from an intellectual framework presupposing some sort of ontological validity to the accounts given by various people who had such ‘near-death experiences’. Likewise, many of the initial investigations would develop their arguments in such a way as to discount possible biological explanations. Recently though, the parapsychologically oriented approach has been much critiqued or rejected outright by prominent investigators of the phenomena. This article outlines the development in near-death research from its earlier episteme rooted in parapsychological models of explanation to its current mode of inquiry which focuses far more heavily upon such factors as what role certain mechanisms in the brain play in such experiences. I intend to illustrate how this shift in focus reflects a more cogent mode of investigating these phenomena than earlier models. Given the subjective quality of the experiences, I hold that there is an epistemic gap that restricts sound investigation of these experiences outside of the realm of phenomenology and the biomedical approach of neuroscience. It is because of this gap, I suggest, that the methodological and explanatory shift has taken place. Perhaps the oldest recorded example of what would now be considered an example of a near-death experience (or NDE) took place in 1889 in Skiddy, Kansas. The account of Dr. A. S. Wiltse is documented in the book Human Personality and Its Survival of Bodily Death by psychical researcher Frederic Myers. Wiltse was ill with typhoid fever and was officially recognized as dead by one Dr. S.H. Raynes after the doctor was unable to detect a pulse for a period of four hours. Wiltse felt himself in a period of temporary unconsciousness followed by his interesting experience. Wiltse felt his ‘Ego’ still connected with his body, which he managed to separate himself from. Now disconnected with his body, he found that those present did not notice him, and that he was capable of passing through their bodies. He left this scene feeling positive and energetic, and eventually encountered an entity in the clouds that radiated a sense of benevolence and told him that by passing beyond a barrier of rocks he would enter the eternal world, but this was dependent upon his being finished with tasks on earth. Wiltse, thinking he has sufficiently done this attempted to cross the barrier, only to find himself back in his body, lamenting the fact that he would yet again have to die. It is unclear as to why such a clear instance of an NDE didn’t occur until the end of the nineteenth century, though Raymond Moody (who first coined the term near-death experience) suggests it may have to do with the developments in resuscitation technology. It may also have to do with a higher incidence of deaths associated with natural degradation than in earlier historical periods. These would involve people on their death beds recounting their experiences to various living eye-witnesses, and it is just such experiences that are illustrated in the work Death-bed Visions written by Sir William Barrett in 1926. Such visions included the dying hearing beautiful music, leaving their bodies, and seeing various spiritual beings coming to take the dying away to another state of being. Albert Heim also researched such phenomena at the end of the nineteenth century. Heim was a Swiss geologist who recorded the accounts of near-fatal falls in the Alps. He noted that many claimed to have experienced their lives quite literally flash before their eyes. Although there are instances of phenomena which all bear similar traits to what are now referred to as near-death experiences, as mentioned earlier the actual term first appeared in Life After Life, the seminal work by Raymond Moody devoted to investing these experiences. Moody first heard of the phenomenon from a psychiatry professor at the University of Virginia, then later from a student after a philosophy class he taught on Phaedo and immortality. He further investigated this topic in classes and found that individuals would speak to him after class about such instances relating to themselves or loved ones. When he later went to medical school he took accounts from patients and doctors that revealed startling similarities. From these, around 150 examples were taken, either from 1) people resuscitated after being diagnosed clinically dead, 2) people who were in accidents or severe injuries that came close to death or 3) the accounts of those that had died that were told by individuals present. Moody narrowed these cases down to 50 prime examples drawn primarily on the first category and it was from this sample that he based the contents of his book. From what he had collected, Moody determined the existence of fifteen different features that consistently appear again and again in the accounts. He notes that while none of the features appear in every instance and that no one account contains all fifteen features, the various features do occur in many of the separate stories, some of them in nearly every account. 15. Corroboration; others present apparently are able to verify information that the ‘dying’ person could not have known at time, such as the position of a book or color of clothing of a person present. Although I want to emphasize again that I am not proposing any new explanations of my own through all this, I have tried to give a few reasons why explanations that are often proposed seem to me at least questionable. In fact, all I really want to suggest is this: Let us at least leave open the possibility that near-death experiences represent a novel phenomenon for which we may have to devise new modes of explanation and interpretation. This sort of open-ended approach to the issue is unique in relation to the other investigators that will be outlined in this essay. Now that I have presented early and foundational works dealing with NDE’s, I will delve into some explanations that espouse specifically parapsychological and to a lesser extent, psychological angles of interpretation. Shortly before Moody would release his influential work, two parapsychologists had already been doing extensive research into the area of what eventually would be labeled as near-death experiences. Karlis Osis and Erlendur Haraldsson (both Ph.D.s in the field of parapsychology) patterned their approach to this field of inquiry upon the investigations of deathbed visions earlier undertaken by Frederic Myers and William Barrett. This research is detailed in their book At the Hour of Death wherein they investigate paranormal claims (such as visions of deceased and telepathic communications with loved ones) of the sick and dying. In this work Osis and Haraldsson elaborate upon findings procured from three studies on the experiences of dying patients. The first two studies took place from 1959 to 1964 in the United States and were conducted by Osis. The third took place in India from 1972 to1973 and was conducted by both Osis and Haraldsson. The first of these was a pilot study where a questionnaire was randomly sent to 5,000 physicians and 5,000 nurses in America regarding their involvement with dying patients and hallucinatory behavior before death, as well as any possible instances where the nearly dead recovered and had unique experiences. Questions regarding the perception of apparitions, religious figures, different environments, rise in mood, and to some extent out-of-body experiences, predicting one’s own death, and experiencing panoramic memory (or the flashing of one’s life before their eyes) all were present in the questionnaire. Of the 10,000 polled, only 640 medical observers replied, though from these there was a total of 35,540 observations of dying patients. According to Osis and Haraldsson the low response reflected the general bias by the professional community against paranormal phenomena. From the reports, 1,318 saw apparitions, 884 reported visions, and 753 experienced a rise in mood before their death. From these findings the subsequent surveys were developed, with specific focus upon the role of apparitions and rise in mood. The core of these cross-cultural findings showed that the majority of the patients who perceived apparitions described them as beings from a postmortem mode of existence (often religious figures or deceased relatives), that these beings were intent upon bringing the dying with them to said existence, and the serenity associated with this prospective existence outweighed their desire to live. Given the initial information obtained from the pilot survey, they developed two contrasting models of possible explanation for the phenomena. The first proposed that the experiences illustrated contact with beings of another plane of existence through a form of ESP, while the latter was a sort of biomedical/psychological model of explanation where the visions represent epiphenomena of a dying brain or stress induced reactions. According to Osis and Haraldsson, each theory hinged upon certain contrasting variables. For instance, the strength of the first model would rest on the vision’s being independent of the influence of drugs and brain related problems. Also the details of the experience would remain relatively consistent and not be influenced significantly by cultural or personal expectations regarding death, the afterlife, etc. According to Osis and Haraldsson, the second model would reflect opposing details; i.e. drugs and various forms of mental or brain related disturbances would further facilitate the experiences, and the various cultural and personal expectations, wishes, desires, etc. would condition the experiences in significant ways. As it turned out, the findings of Osis and Haraldsson reflected data that supported their ESP hypothesis. Painkillers such as morphine and Demerol were not related to the visions, various brain disturbances either did not effect or decreased afterlife related phenomena, and there was no evidence found to support that psychological factors such as stress facilitated afterlife visions. As far as cultural influence was concerned, although certain features common to each religious background reappeared (for example, the other existence may be identified with heaven by Christians and sometimes the figures were identified as Yamdoots, or servants of death, by Hindu patients) devils or hell never featured for Christians and reincarnation or dissolution into Brahman never were apparent to the Hindus. So although cultural background seemed to color details of the experiences, they did not seem to lie at the core of the experiences. Despite their findings, there are various problems present in the argument set up by Osis and Haraldsson. Issues with the reliability of findings derived from ESP related research notwithstanding, the pair develop their polemic against biomedical/psychological explanations in a limited manner. Their suggestion that a possible brain state correlated with the experiences described by dying patients would be heightened by additional influences such as painkillers and brain damage is an unwarranted assumption. They seem to assume that any factor that can be broadly connected with causing ‘hallucinations’ would contribute to the common state associated with the NDE, without taking into account the myriad varieties of unique states of awareness that are distinct and often mutually exclusive in their causes and resultant perceptual phenomena. This is like presuming that because both stimulants and psychedelic drugs can cause hallucinations, that both experiences will be similar. Also, they do not seem to acknowledge the possibility that those features of the experience that transcend cultural differences may have their root in a common biological mechanism of action. If this is the case, it could explain how human beings (or at least a certain portion) have some basic neurological predisposition to this common experience. This could also explain the unique cultural aspects since certain cultural influences (the alternate existence being represented as heaven, the beings as Yamdoots, etc.) could figure as meaningful content that attaches to the underlying brain state which is then made congruent with the given religious background of the dying person. I will now turn to another prominent investigator of NDEs with a parapsychological approach to the subject. From 1977 to 1978 Kenneth Ring, a professor of psychology at the University of Connecticut who was motivated by the work of Moody and his own curiosity, interviewed 102 patients or former patients that had survived or been resuscitated from clinical death as a result of illness, accident, or suicide attempt. This interview inquired about demographic information, a narrative of the NDE, questions designed to investigate the prevalence of Moody’s 15 features, aftereffects of the experience, and a comparison of the religious beliefs of the person before and after the event. The details and implications of the results of these inquiries outline Ring’s book Life at Death, often considered to be the most detailed investigation of NDEs by many figures in the field. From his studies, Ring was able to establish that the core experiences of the people interviewed occurred in five stages whose frequency of occurrence diminished as the stages progressed. The first stage was a sense of peace or well being where the patient had a feeling of euphoria or calm (akin to Moody’s third feature). The second stage was the experience of being separated from the body (akin to Moody’s sixth feature). The third stage is that of entering darkness. This is akin to both Moody’s fifth and tenth feature. Essentially the person would enter some mist or tunnel, but consistently some dark and peaceful space was described. The fourth stage is that of seeing a brilliant light that doesn’t hurt to look at which is generally analogous to Moody’s eighth feature. Ring describes how beings are often though not necessarily associated with this stage and that they tend to have a religious identity for those with a religious background. Ring’s fifth and final stage is that of entering the light which has no absolutely clear correlate with Moody’s system. In this stage the dying perceives a scene which is where the light seems to originate from. This place is described as beautiful, colorful, and though similar to our world, ultimately unlike anything within it. The first core experience of a sense of peace or well being (stage I) occurred with 60% of those interviewed; the experience of being separated from body (stage II) occurred in 37%; 23% experienced entering darkness (stage III); 16% encountered the light (stage IV); and 10% of those interviewed entered the light (stage V). Ring also investigated the ways in which the NDE was brought on affected the occurrence of core experiences. For those that experienced NDEs brought on by illness, 75% reached stage I, 37% reached stage II, 29% reached stage III, 27% reached stage IV, and 17% reached stage V. NDEs brought on by illness represented the most typical breakdown of the core experiences, while those brought on by accidents and suicide attempts were more anomalous. For accident victims, 44% experienced stage I, 37% experienced stage II, 26% reached stage III, and 15% reached stage IV and V.
What is especially unique about accidents is the high rate of the experience of a panoramic life review. 55% of the accident victims experienced this while only 16% of those in the other two categories experienced the review. As for the suicide victims, 75% experienced stage I, 37% reached stage II, 21% reached stage III, but there is a complete absence of either stage IV or V.
In addition to the absence of the latter core stages there is also a sense of confusion and drifting and also the highest level of non-recall (67%) is present amongst suicide attempters. Ring touches upon how this may seem to illustrate how there is something unique about suicides that causes these phenomena, though he suggests that the most likely cause is due to the fact that all but two of those attempting suicide in the study used drugs and/or alcohol in their attempt. As such, the experience very likely would be influenced by the pharmacological effects of the substances they had taken. Like Osis and Haralson, Ring found various neurological and psychological explanations of the phenomena lacking (essentially because of the limited investigation by these fields into the phenomena at the time). As such he developed a unique two-part explanatory model that combined aspects of parapsychology and theories in holography and brain function, which he labeled the ‘parapsychological-holographic explanation of the near-death experience’. For the first part of his theory, Ring focuses primarily upon the out-of-body aspect of NDE’s. He draws extensively upon ideas found within parapsychology and western esotericism to cite commonalities amongst individuals who experience out-of-body experiences (OOBEs) to establish the actuality of such bodily separation. Ring merely relies upon the frequency and consistency of such accounts as evidence for their validity without really touching upon how these same phenomena in all likelihood could represent epiphenomena of brain function, not unlike those that could be connected with NDEs. The second aspect of Ring’s theory is based upon ideas developed by Karl Pribram. Pribram suggested that the brain functions like a hologram by taking the interference patterns of energy waves in the brain brought on by external stimuli and thus constructing mental content into a holographic representation. Ring focuses upon the idea of ‘frequency domains’ within the theory which deal with information in a state outside of space and time. Ring suggests that during NDEs the holographic mode of awareness becomes entangled with a ‘frequency domain outside of space and time’, and this represents the transition to the new state of reality. The second error is to suggest that consciousness can function in this other reality without the brain. This not only implies that consciousness goes somewhere else, it also stretches the holographic model a very long way from its origins. It began as a theory about brain function; a theory that suggested the brain operated on frequency analysis and holographic storage. It is an extreme, and as far as I can see quite unwarranted, leap to say that consciousness is something separate and can function without the brain that is supposed to be doing all this holographic analysis and storage. Ring’s theory pushes Pribram’s controversial notions outside their applicable domain, and because it does this is largely hampered. Before I shift focus to the other explanatory models, it is important to illustrate certain key issues with using a parapsychological methodology to investigate NDEs. I will draw upon a critique of four primary arguments for a paranormal/afterlife hypothesis used by Susan Blackmore. The first argument is that of consistency. Basically, this argument suggests that the cross-cultural consistencies of NDEs are evidence supporting an ontologically ‘real’ place that dead people ‘go’ when they have the experiences since cultural expectations are minimally expressed in NDEs. I dealt with this earlier when I mentioned how this can be accounted for just as easily by an internal biological mechanism. The second argument or ‘reality argument’ suggests that the typically very strong subjective conviction that what is experienced is a ‘real’ or ‘true’ event implies that the events were, in fact, real. Blackmore counters by saying that the distinction between what is ‘real’ and ‘imaginary’ is to an extent artificial and built upon models of representation developed by various systems of the brain. The activation of a brain area connected with ideas of meaningfulness, familiarity, and other earmarks of reality could be effected during NDEs and give the same impression caused by ordinary stimuli associated with these states. The third argument, the ‘paranormal argument’, emphasizes the ability for someone having a NDE to have knowledge or information supposedly inaccessible to somebody in such a state. This detail was included in Moody’s 15 features (Corroboration) and has been used as evidence by paranormal researchers like Osis and Haraldsson as well as Kenneth Ring. Blackmore first suggests that the evidence for such accounts is weak and in many cases such scenarios have been exaggerated or even falsified. Also, she notes that even if there is an instance of some form of paranormal activity occurring, it need not be explained by an afterlife, it may illustrate some form of ESP (unlikely as this explanation may also be, it still warrants a possible alternative to an afterlife hypothesis). Finally, there is the transformation argument. Essentially this argument states that after NDE’s the positive transformations of individuals who often become more spiritual and altruistic, no longer fear death, and more fully embrace life are evidence of a truly spiritual encounter. To this she states that having such profound experiences as those described and coming to the brink of death is certainly enough of an experience in itself to motivate various insights and shifts in ones priorities and values. Given the fact that parapsychological explanations posit the existence of realities that cannot be measured instrumentally or witnessed by individuals not having NDEs, they become suspect. There is an epistemic gap between the subjective experiences described by people having NDE’s and those that are not, since there is no effective way to verify the ‘authenticity’ of such experiences in relation to any sort of ontologically real place which their experience would be reflecting. The problem with paranormal explanations is that the phenomena they attempt to explain can be explained by neurological models (as I will later illustrate) without completely up-heaving accepted models of science, and the principle of Occam’s Razor dictates that the simpler theory is a more sound one. Because of this gap, parapsychological explanations are inadequate in scientifically accounting for NDEs. Before I close this segment and begin my section on neurological explanations I will briefly discuss a few psychological explanations given for NDEs and bridge the gap between the earlier and more tenuous explanation to the more scientifically accepted model currently used to explain NDEs. The early research of Noyes and Kletti (those responsible for discovering and reviving the research of Swiss geologist Albert Heim) espoused early psychiatric explanations for the accounts of people in life-threatening situations like accidents, falls, and drowning. In their accounts there was a greater emphasis upon the occurrence of feelings of detachment and loss of emotions during these events. As such, they suggested that depersonalization was responsible for such accounts. Greyson is also a psychiatrist and has interpreted NDE’s in ways congruent with his discipline. For example, the euphoria associated with NDEs he suggests may be related to aid in potential survival of life-threatening situations, since it could aid in conserving energy reserves. Greyson suggests that the belief of having definitely died and come back serve to lessen any sense of guilt that might otherwise occur when one has survived in this state rather than died like so many others in such situations. Likewise, the perception of passing through a tunnel to another state of being filled with light and helpful figures may reflect the activation of archetypal imagery associated with the birth-process. Psychological explanations may hold some value in understanding NDEs, but they are found lacking. The notions espoused by Noyes and Kletti completely fall short and the psychological explanations espoused by Greyson are at best limited. Notions of re-experiencing aspects of one’s birth and archetypal imagery are generally not accepted concepts within the current psychological paradigm. This being said, there may yet be fruitful research derived from the behavioral or cognitive schools of psychology, especially regarding aspects of the apparent construction of perceived scenery and images as well as certain associations connecting culturally, religiously, or personally significant imagery with certain aspects of NDEs. Unfortunately, such research to my knowledge has yet to be conducted. Still, the strongest evidence for accounting for NDEs lies with explanations rooted in biological function. Since biological models utilize theories and instruments that can provide sound data accounting for subjective experiences, it is little wonder that the general paradigm for investigating the phenomena has shifted towards neurological science. Now that I have examined the primary parapsychological and psychological explanations I will turn my focus to neurological explanations of NDEs. One neurological explanation for NDEs is anoxia. Essentially, cerebral anoxia is when the brain ceases to receive any or enough oxygen. 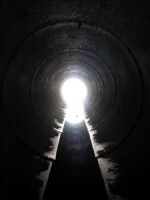 Anoxia has been known to cause visions and out-of-body experiences, and random excitation of the visual cortex (a region of the brain connected with the perception of visual phenomena) due to anoxia might possibly be responsible for the experience of the tunnel and the light. In addition to anoxia, hypercarbia (or heightened levels of carbon-dioxide) may play a role. Hypercarbia has been known to cause hallucinations, OOBEs, euphoria, and mystical experiences. Both anoxia and hypercarbia are often symptoms of those near death because of arrested breathing and/or a weakened pulse rate which would decrease the amounts of oxygen reaching and carbon dioxide leaving the body. However, using brain gas levels as an explanation for NDEs is somewhat problematic. One primary issue is that anoxia and hypercarbia would only account for some NDEs; those which would inhibit normal oxygen and carbon dioxide flow amongst brain tissue, such as near drowning, cardiac arrest, or suffocation. Therefore, other instances (most notably those where no physical injury occurred) would require some alternative explanation. Nevertheless, the involvement of gases in the brain may be connected to other underlying causes that may be related to NDEs. Endorphins are chemicals released by the body when under extreme duress that cause the alleviation of pain. These chemicals have been suggested to play a role in NDEs, specifically connected to the euphoria felt throughout the experience. Their possible role is supported by the case of a 72-year old patient that was given naloxone (a drug that diminishes the effects of opiates as well as the naturally occurring endorphins) and his NDE changed tones from being positive and euphoric to hellish. This direct effect on the experience warrants the assumption that endorphins do indeed play some role in the experience. Nevertheless, endorphins are not directly linked with other aspects of NDEs, such as the more visionary aspects. Its role in these phenomena is unclear. It is important to note, however, that endorphins (and also anoxia) lower the seizure threshold in both the temporal lobe and the limbic system. The temporal lobe is a region of the brain that when stimulated has been known to induce hallucinations and OOBEs. The limbic system is a region of the brain that is connected with strong emotions and memory, and may play a role in the ‘life review’ aspect of NDEs. A seizure in these regions of the brain induced by either anoxia or heightened endorphin levels could cause the sort of brain stimulation that would illustrate details outlined by those who have had NDEs. Given the potential interactivity of the above listed variables, there is a possible system of action responsible for NDEs. Though it is possible that the above factors may be enough to cause NDEs, there has been recent research involving two different factors that may also play some role in NDEs. Karl Jansen is a medical researcher who has studied the similarities between NDEs and the effects of the drug ketamine. Ketamine is an anaesthetic that is capable of reproducing all of the core experiences outlined by Kenneth Ring, as well as some of the other notable features mentioned by Moody like hearing music and passing through a tunnel. This substance binds to receptor sites (regions where signals in the brain are carried from one cell to another) in the brain known as the N-methyl-D-aspartate (NMDA) receptors and blocks the neurotransmitter (a chemical that relays, amplifies, or modulates signals sent by other cells) glutamate. It has been shown that states that are similar to those that precipitate NDEs (hypoglycemia or low blood sugar, low blood pressure, anoxia, and temporal lobe epilepsy) cause a flood of glutamate to be released. Such high levels of glutamate cause the NMDA receptors to become overly active and destroy neurons (brain cells). There has been tentative research concerning certain peptides known as endopsychosins (especially alpha-endopsychosin) as well as certain ions such as magnesium and zinc and their potential to bond to these sites. Though still speculative, Jansen suggests that one or all of these are a natural defense against cell death when the brain is flooded by glutamate. Given the potential for the brain to release high levels of glutamate during biological states often present near death, this same defense system could be responsible for NDEs. The second possible component that could play a role in NDEs has been investigated by psychiatrist Rick Strassman. Strassman administered DMT (or n, n-dimethyltryptamine), a psychedelic compound found in various natural sources such as plants and animals which has a long history of usage amongst various cultures, to subjects and recorded their experiences. Based on these studies, he proposes that NDEs (amongst other states of awareness) are caused by the release of endogenous (or internally produced) DMT. DMT is an extremely powerful substance that causes euphoria, OOBEs, hallucinations which include but are not limited to lights, tunnels, and the experience of visiting foreign existences populated by entities of various kinds. This substance is also found in the human brain. According to Strassman’s untested hypothesis, it is produced within a small gland in the brain known as the pineal gland. This speculation is based on the prominence of certain necessary chemical precursors of DMT found in this gland as well as its central location in the brain. Strassman suggests that extreme stress states (such as during NDEs) release stress hormones called catecholamines which cause various mechanisms in the pineal gland to release DMT. Indeed, the euphoria associated with the DMT experience is directly correlated with the additional release of endorphins. Within the studies Strassman performed where he administered levels of DMT to test subjects, he noted significant levels of beta-endorphin (an extremely powerful endorphin) in the blood soon after being injected with DMT, thus showing the influence of the one chemical on the other already noted for its possible connection with NDEs. As such, it is possible that the details described by people having NDE’s could be caused by the stress-induced release of the psychedelic DMT. Having illustrated the various neurological hypotheses that seem to underpin NDEs I will conclude this article with a brief discussion of these different biological theories, how the discourse on NDEs moving from parapsychology to neurology is a logical and necessary one, and also how there is still much room for further investigation of these phenomena within neurology and the social sciences. Given the various possibilities for explaining NDEs from a neurological perspective, one might wonder which of the above explanatory suggestions is most fitting. In all probability it is a combination of interactions with some or possibly all of the above listed neurotransmitters, hormones, ions, gases, and brain regions that are responsible for the induction of the brain states associated with NDEs. The human brain is the most complex system yet known, and as such it would be naïve to assume that there is a magic bullet that effectively explains away all of the various interacting variables responsible for NDEs. Indeed, given the unique quality of various NDEs and certain differences described, certain neurological explanations may play a greater role than others in varying cases. For example, the high incidence of panoramic life reviews amongst accident survivors illustrated by Ring may be connected to the stress-induced release of catecholamines and the subsequent release of DMT. Likewise, in instances where cardiac or respiratory issues come into play then hypercarbia, anoxia, and possibly subsequent seizures in certain brain regions may play a primary role. Similar things could be said regarding the stages of NDEs described by Ring. Stage one’s sense of calm and euphoria could be connected to the release of endorphins, stage two’s out-of-body experiences could be connected to the release of endopsychosins, and the final stages of light and entering beautiful and other-worldly realms could be connected to the release of psychedelic DMT. Still, there are problems with considering the neurological factors as the key to understanding NDEs. Being able to measure and replicate brain states associated with or identical to NDEs may tell us a great deal about the mechanics of the experience but it says little about why such experiences take the form and shape that they do. The intricate complexities of the visions seem to involve the interplay of complex psychological and cultural images, constructs, and processes that cannot simply be explained with the strict reductionist approach of neurology alone. Given the limitations of the neurological interpretations, it seems clear that other avenues of inquiry would be useful in understanding ‘why’ based questions of NDEs. And although psychological explanations such as those detailed by Bruce Greyson earlier have some appeal, they seem somewhat limited. Whether in the field of psychology, sociology, or some alternative discourse there is a great deal of room for further understanding certain aspects of NDEs. Nevertheless, the general course of development taken for the investigation of NDEs from parapsychology to neurology is a natural and logical one. The limitations of current models still exceed the methodology of parapsychology. But, even though this is the case, there is much mystery surrounding the near-death experience. Even though the likelihood of any objective validity to the experiences of people on the verge of death are inherently limited by epistemic ground rules of inquiry, the possibility of a person having a genuine experience of some separate reality cannot be discounted out of hand. And even more importantly, the value taken from such experiences seem truly remarkable. Whether or not the experiences of the dying are genuine in any conventional sense of the word may be far less significant than the importance connected to them by the people who have experienced them. Blackmore, Susan J. 1992. Beyond the Body: An Investigation of Out-of-the-Body Experiences, Chicago: Academy Chicago Publishers. ____________ 1993. Dying to Live: Near-Death Experiences, Buffalo: Prometheus Books. ____________ 1996. ‘Near-Death Experiences’, Journal of the Royal Society of Medicine, 89, 73-76. Greyson, Bruce & Flynn, Charles P. (eds.). 1984. The Near-Death Experience: Problems, Prospects, Perspectives, Springfield: Charles C Thomas Publisher. Meyers, Frederic. 1904. Human Personality and Its Survival of Bodily Death, New York: Longmans, Green, and Co.
Moody, Raymond. 1975. Life After Life, New York: Bantam Books. Osis, Karlis & Erlendur, Haraldsson. 1997. At the Hour of Death: Third Edition, Norwalk: Hasting House. Pribram, Karl H. 1971. Languages of the Brain: Experimental Paradoxes and Principles in Neuropsychology, Englewood Cliffs: Prentice Hall. Ring, Kenneth. 1980. Life at Death: A Scientific Investigation of the Near-Death Experience, New York: Coward, McCann, & Geoghegan. Strassman, Rick. 2001. DMT: The Spirit Molecule, Rochester: Park Street Press. Myers, Human Personality and Its Survival of Bodily Death, 315-322. Moody, Life After Life, 145. Blackmore, Beyond the Body, 138. Moody, Life After Life, 14-18. Osis & Haraldsson, At the Hour of Death, 28-29. Ring, Life at Death, 27-29. Ibid, 39-40, 53, 56-57, and 60. Pribram, Languages of the Brain, 152-153. Ring, Life at Death, 236-237. Blackmore, Dying to Live, 144. Ring, Life at Death, 21. Blackmore, Beyond the Body, 149. Bruce Greyson, ‘The Near-Death Experience Scale: Construction, Reliability, and Validity’; taken from Greyson & Flynn, The Near-Death Experience, 57. Bruce Greyson, ‘The Psychodynamics of Near-Death Experiences’; taken from Greyson and Flynn, The Near-Death Experience, 166-169. Blackmore, Dying to Live, 54. Jansen, ‘Using Ketamine to Induce the Near-Death Experience’, 55-60. Strassman, DMT: The Spirit Molecule, 69-71.